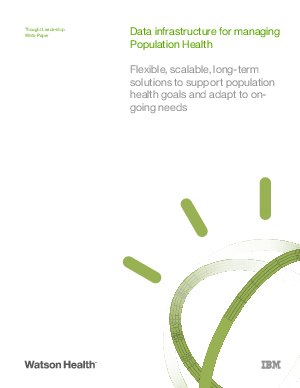 To address the volume, velocity, and variety of data necessary for population health management, healthcare organizations need a big data solution that can integrate with other technologies to optimize care management, care coordination, risk identification and stratification and patient engagement. Read this whitepaper and learn how to build an effective data infrastructure. You’ll discover how to use the right combination of data sources, a “data lake” framework with massively parallel computing, and analytic tools that identify care gaps and potential rising risk. You’ll also learn to incorporate predictive modeling and effective screening mechanisms that find relevant data. In addition to learning about these crucial tools for making your organization’s data infrastructure robust, scalable, and flexible, get valuable information about big data developments such as natural language processing and geographical information systems. Such tools can provide insight into factors such as how patients’ work and home locations impact the care they receive.